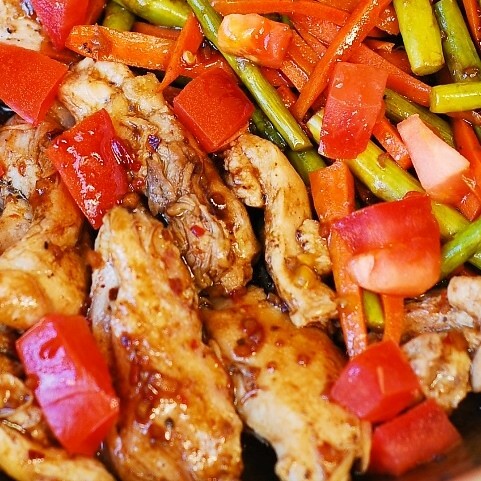 Balsamic Chicken with Asparagus and Tomatoes – delicious, healthy, low fat, low cholesterol, low calorie meal, packed with fiber (vegetables) and protein (chicken). Finally combine everything in one pan and serve! You’re very welcome! I am glad you liked it! Yuck. Sorry, but this dish tastes just awful. Not a good combo with the carrots and tomatoes. The sauce doesn’t combine well and tastes sour and not in a good way. Way to hard to get the recipe. Why are there no real directions. How do you make the balsamic mixture. Is it just balsamic vinegar?? You have to click on the link for the actual recipe.